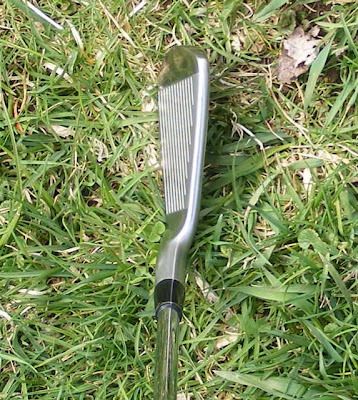 Just to give you some feedback last year I played a set of Titleist 735cm irons that I hit OK especially the shorter irons but I had some problems with the longer irons. 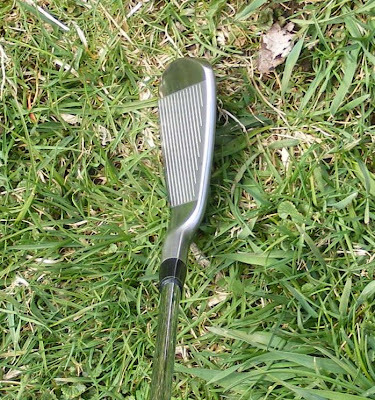 Now I'm a bit of a club ho and sometimes I end up testing out and playing clubs that are way over my playing ability probably this was the case with the 735cms as well as a few other clubs that have passed my door. But call me crazy I love to try different clubs and sometime they work and other times you just have to move on. So what is a 19 handicapper to try now. Well they might not be Bridgestone's latest offering but I've always like the look of Bridgestone irons so when a set of new Bridgestone GC Mid irons happen to cross my path I grabbed them and have been testing them out for most of the Spring. I'm one of those crazy golfers that keeps back issues of various golf magazines (even thought the wife tries to get rid of them) I always make sure I keep the Golf Digest issue that has the Hot list in it and these irons made the list back in 2007 so why not give them a try right? Adding to its already popular TOUR level golf clubs and balls, today Bridgestone introduced its new Gravity Chamber (GC) series of irons for longer distance, higher moment of inertia and improved launch conditions. The GC Series features two models, the GC.MID and the GC.OS, designed to make shots easier to control for two distinctly different types of players. 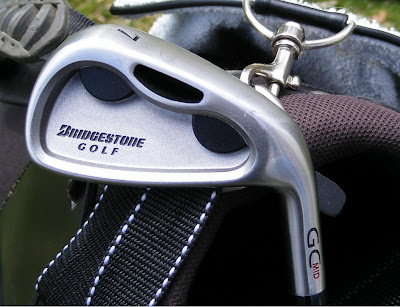 The GC series employs a technology that allows Bridgestone engineers to remove inefficient weight from the clubhead where it is not helping to improve golfers’ games, and strategically repositions it to create a center of gravity at an optimal location, improving launch conditions and accuracy. The GC.MID irons provide the feel better players demand, with forgiveness golfers of all ability levels can use. The GC.MID features a Gravity Chamber in the back cavity of the clubhead from which significant weight is removed. The weight is repositioned by using Gravity Disks that increase moment of inertia and as a result produces a reduction in clubhead twisting on off-center hits, generating a straighter ball flight. The strategic placement of the disks creates a precise and progressive center-of-gravity location that provides enhanced control and improved launch conditions. The combination of repositioned weight and progressive center-of-gravity produces long irons that fly high and are easy to square, and short irons that have a flatter ball flight with greater stability for ultimate shot shaping potential. This is accomplished by positioning the disks farther apart in the long irons and progressing the disks closer together throughout the mid and short irons. Both sets of Gravity Chamber irons are created from 431 soft stainless steel for tremendous feel and consistency. The GC series of clubs all feature a thin-face design that increases ball speed at impact, translating into irons that fly further. In addition, the strategic location of the Gravity Disk placement in both sets produces a more solid feel and sound when striking the ball. 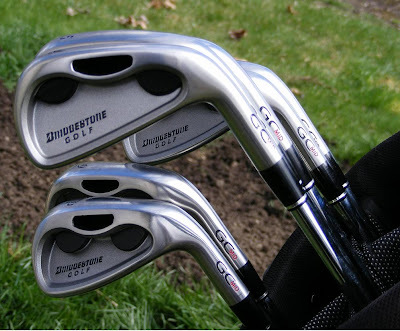 "The GC series of irons are our most forgiving clubs yet," said Mike Moxie, Golf Club Marketing Manager, Bridgestone Golf. "By providing better players with unsurpassed feel and workability that they demand, yet providing some assistance to those players who aspire to play a premium level product, we feel that we’ve created two sets of irons meeting the requirements of a wide range of skill levels. Don’t be surprised to see people in your weekend foursome and the best players in the world relying on this breakthrough technology this fall." The GC.MID irons are available in 2-PW with stock Nippon® NSPRO® 1050GH shafts. The GC.OS irons are available in 3-SW with stock Nippon® NSPRO® 950GH shafts. The clubs also feature a Golf Pride® Gravity Chamber grip. Custom options for grips and shafts are available. (The GC.MID will be the first clubs in the Bridgestone line that will be available in a left-handed model (available Spring 2007). Both the GC.MID and GC.OS irons will feature a suggested retail price of $699 (steel) and $799 (graphite) and will be available at golf specialty stores and green grass retailers nationwide, beginning Fall 2006. For more information on the GC Series and any other Bridgestone Golf products visit www.bridgestonegolf.com. My initial impressions on my new Bridgestone GC Mids w/Nippon 1050GH's after some early Spring range sessions and a few rounds. Looks - These really don't look like a GI iron (game improvement). They have a real thin top line and very little offset as you can see from the pictures. I like the fact that even with the gravity disks in the cavity of these irons they still aren't busy looking. No crazy colors or designs. The heads on these irons are just the right size not to big or not to small hence the model name (Mid- midsize). Because they are game improvement clubs the heads are on the heavy side. Feel - These feel quite soft for a cast club, you can definitely feel when you hit both good and bad shots. I've played a Nippon shaft in my 21 degree Titleist 585H hybrid and I've always like it. So far I'm still figuring out if I like these shafts. For me they have a lower ball flight similar to my 735cm w/ DG S300s. 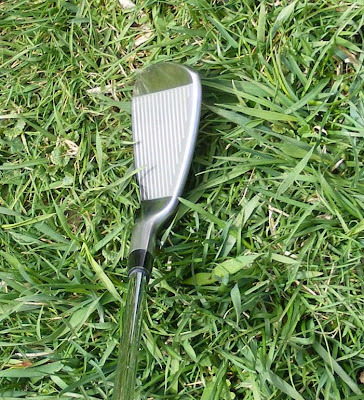 Forgiveness - These are pretty forgiving clubs especially on toe and heel shots. You still get pretty good distance and for me it usually ended up left. You just know it's your swing that's the trouble. So there is definite feedback when it comes to toe and heel shots. Workability - My natural ball flight tends to be a draw and when worse comes to worse the dreaded hook. So far I'm still trying to figure out the workability of these irons. The longer irons I've only been able to hit either straight or with a draw. I've been playing into some crazy winds lately so the lower ball flight I've been getting has been good. The short irons have been mainly straight and the distance a little bit shorten then my last clubs. Thanks for the info OGB, its been very helpful. I use to be a teaching pro many years ago and you mentioned something about your off shots always end up to the left. I think I can help you with that. 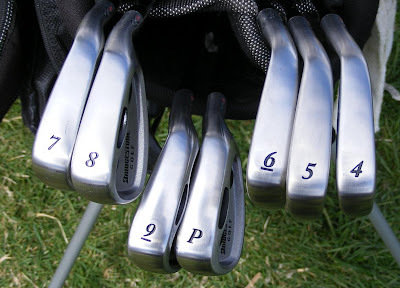 The player view photo's you posted of the irons, are they square to target or close in your opinion? Most left misses come from closing your face at address. Sometimes because your quick at the top from not finishing your back swing but it's the closed face set up that will get you every time! A quick fix - find a square angle like tile on your kitchen floor and use the lines in the floor to set your feet and your club face. At first your club face looks open but trust me, it has to be square if your setting up correctly. It takes a while to get use to seeing your club face looking open but your eyes will be retrained to see a perfectly square looking face. Good Luck and thanks!